Rule 11-4 deals with situations where a player puts a ball into play from outside this defined area, and Rule 11-5 extends this to when a player plays from a wrong teeing ground, stating that the provisions of Rule 11-4 apply. • A player tees their ball in front of an imaginary line drawn between the fronts of the tee markers (as in the photo). • A player tees their ball on the wrong side of the tee markers, e.g. to the left of the left tee marker. • A player tees off from behind the wrong tee markers, e.g. from white tee markers when blue tee markers are the ones in play. • A player tees off from within the teeing ground of the wrong hole, e.g. after finishing the 6th hole they play from the tee markers of the 11th hole instead of the 7th hole. The Head Rules Official correctly pointed out that the competition's notice clearly indicated that players were to play from the gold tees; it did not say, “Unless they are placed incorrectly”. It was the players’ responsibility to conform to that Rule. Edit 22nd March 2016: I should have clarified that in match play, if a player plays a ball from outside the teeing ground, there is no penalty, but their opponent may immediately require the player to cancel the stroke and play a ball from within the teeing ground, Rule 11-4a. South Korean, Hyun-woo Ryu, was one of the first professional golfers to benefit from a Rule change that came into effect on 1st January this year. Earlier this month, during the New Zealand Open at The Hills, he played from the wrong spot after taking a drop at the first hole of his third round and went on to sign for an incorrect score because the situation did not come to light until the following day. If a competitor returns a score for any hole lower than actually taken due to failure to include one or more penalty strokes that, before returning his score card, he did not know he had incurred, he is not disqualified. In such circumstances, the competitor incurs the penalty prescribed by the applicable Rule and an additional penalty of two strokes for each hole at which the competitor has committed a breach of Rule 6-6d. This Exception does not apply when the applicable penalty is disqualification from the competition. So, Ryu received a penalty of two strokes for playing his ball from a wrong place and, under the new Rule, an additional penalty of two strokes for signing for an incorrect score card. Without this additional penalty he would have finished tied for sixth, but instead the 34-year-old had to settle for a share of 16th place. However, I am sure that he would agree that this was better than being disqualified! It is inter-Club match play time again for many golfers in the Northern Hemisphere. A good time to check out my 'So You Are Going to Play Match Play' eDocument (click here) and my 'Match Play Quiz' eDocument (click here). 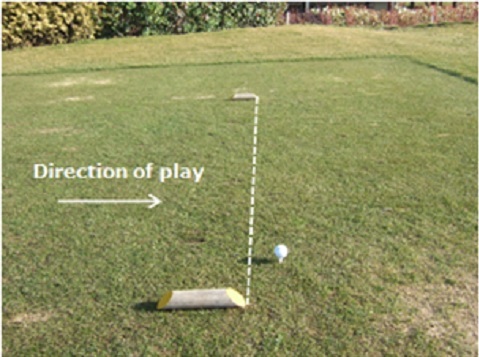 A player tees their ball in front of an imaginary line drawn between the fronts of the tee markers (as in the photo). This is a little misleading as it implies that a tee placed ahead of the line would be a breach. It is not required that the tee be within the teeing ground, but that the ball be within the teeing ground. No, the phrase states that the ball is is in front of the imaginary line. "Tees" is used here as a verb; there is no reference to the tee, which is a noun. Barry, How is 6-6d applied in Stableford if for example a player incurs 2PS on one hole when his score recorded score for that hole resulted in (a) 2 pts and (b)0 points? And in both cases would 2 pts be deducted from his total pts score ? Many thanks. It's fair to say what you've described is correct for Strokeplay, but matchplay however is a different matter is it not? Might be worth explaining? I have now added a paragraph on the match play situation. Note 3: If the competitor incurs the additional two-stroke penalty provided in the Exception to Rule 6-6d, that additional penalty is applied by deducting two points from the total points scored for the round. The penalty the competitor failed to include in his score is applied to the hole where the breach occurred. However, neither penalty applies when a breach of Rule 6-6d does not affect the points scored on the hole. I'd like to tease out the 'outside the teeing ground' issues in the situation of a provisional ball or another ball played from the tee under R26, 27 or 28 - the stroke and distance options. In the case of starting play of a hole, a shot struck from outside the teeing is not in play and there is a 2 shot penalty. So the ball must be played again from within the teeing ground so it is then becomes in play. And it doesn't matter how many times the ball is played from outside the teeing ground, it is not in play until played from within the teeing ground. I also understand that the penalty is unchanged regardless of the number of failed attempts to play from within the teeing ground. Is this correct? But for a provisional ball played from the tee, or another ball played under the stroke and distance rules, if such balls are played from outside the teeing ground (for example just in front of the line) do they require to be replayed or is it just a matter of playing from a wrong place, 2 shot penalty and the ball is in play? Yes, any strokes made with the original ball played from outside the teeing ground at the start of a hole, and any subsequent strokes made with any ball before successfully playing a ball from within the teeing ground, do not count. This includes a provisional ball played after a ball that has been played from outside the teeing ground if it is also played from outside the teeing ground. No ball counts until after a ball is properly played from within the teeing ground. If a players palys from the wrong place but continues to play on the hole without correcting the mistake and is therefore disqualified, does is this score then recorded on the scorecard. would this be classed as NR or would the actual stokes taken (albeit incorrectly). I ask because this situation has occurred and the strokes taken have been counted resulting in a loss of a shot even though disqaulification has ensued. Unlike the Rules of Golf, which are unified across the world, there are a range of different handicapping systems used by national golfing bodies and I do not have expertise in this area. You should consult the handicapping manual for the national golfing body involved, which are usually available on-line. Following a Rules change from 1st January 2016, you did not incur the penalty of disqualification, but in addition to the penalty of two strokes for the breach of Rule 11-5, you have to penalise yourself two more strokes under the Exception to Rule 6-6d. This is particularly important amendment for competitions played over more than one round. Occasionally I tee up with my feet outside this Zone. Is that an infraction? A player may stand outside the teeing ground to play a ball within it. Rule 11-1.